As you probably have noticed already, I really like my soups though I don’t make them often enough unfortunately. That is because I don’t really like cooking, at least not that much anyway, I am more into tech stuff and other manly things like this, I choose to make various dishes now and then because of my wife’s very busy schedule. Between her day job and blogging there is not much time left to try all the dishes/recipe that we would like to. 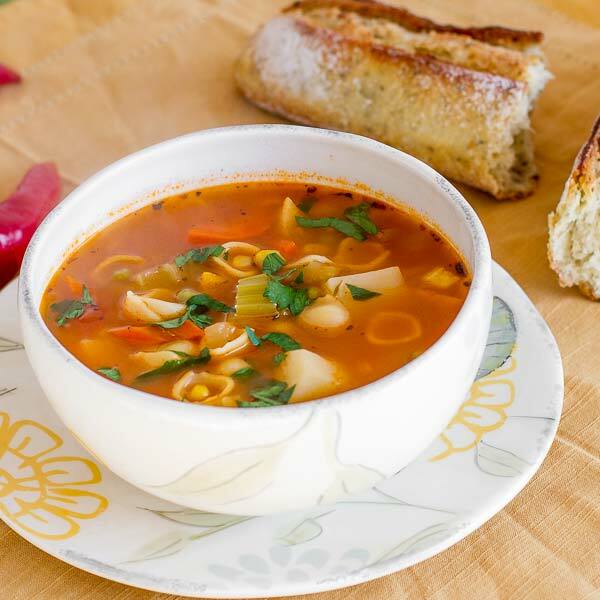 Take minestrone for example, I have always been fascinated by the Italian cuisine though focused on pizza mainly, not much interest in pasta and definitely did not care about soups at all, at least not until I first tried minestrone in a restaurant and I really liked it. A while ago I decided to give it a shot myself, mainly due to my love for soups and after doing a bit of research on the matter, this is my take. Now, minestrone is supposed to include beans and have a thick consistency, but I changed mine a bit, I used sweet peas instead and is not that thick either. Simply delicious! Anyway, the more I read about minestrone, the more I realized that can be made with any combination of vegetables you can think of so, if you don’t like some ingredient in my recipe, feel fre to swap it for your own. The result will always be the same, I assure you and that is… delicious!. Enjoy! In a large stockpot, heat oil over medium high heat; add the onion and cook until translucent. Add garlic, celery and carrots and cook for about 5 minutes or until they begin to soften. Stir in dried oregano, basil, a pinch of salt and pepper. Pour the chicken/vegetable broth and diced tomatoes to the pot and bring to a boil. Reduce heat to medium low and simmer for 10 minutes. Add sweet peas and pasta and cook until pasta is done (usually around 10 minutes). Remove from heat, add fresh parsley and cover with a lid; let it rest for 5-10 minutes then serve. I’d love to eat this minestrone soup on a cold day, looks so appetizing!